I am loving all of the seasonal flavors this year. I've baked peppermint treats, I've been huddled up with warm bowls of chili, and I'm drinking my eggnog. It makes it all that much easier to get into the holiday spirit with the cooler temps we've experienced the past week or so. 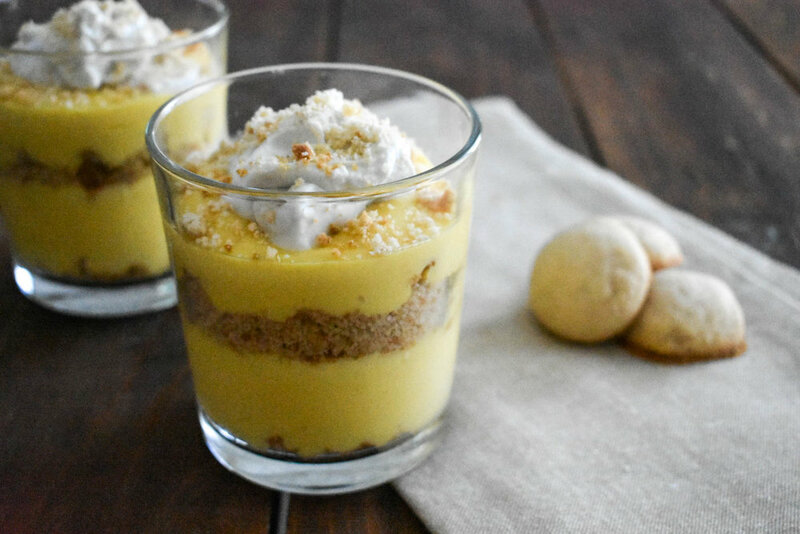 This eggnog and shortbread trifle is my new favorite holiday treat. Trifle definitely isn't one of the more well-known desserts, but as someone with English background it became my go-to item to bring to cultural gatherings. Basically it's just some type of layered dessert with cake or cookies, fruit filling, pudding, and/or whipped topping. Like most English items, there are no rules and it can consist of anything you can find in the kitchen. This recipe was also my first attempt at making homemade from scratch pudding. Let me tell you. Way easier than I anticipated it would be. It definitely wasn't my first time making shortbread though, since these cookies (minus the jam filling) is one of my favorite treats to make this time of year. In a saucepan over medium-high heat, combine the eggnog and sugar. In a small bowl, mix the arrowroot powder and milk until there are no lumps. Add in the egg yolks and whisk. When the eggnog comes to a boil, stir in the milk and egg yolk mixture. Continue to cook the mixture over heat until it thickens, about 5 minutes. While the eggnog mixture thickens, place your shortbread cookies in a ziploc bag and crumble. Pour some of the cookie crumbs into the bottom of glasses to create the base (I used small bar glasses). Top the cookie crumbs with spoonfuls of the eggnog pudding, filling the glasses a little less than half-way full. Repeat with cookie crumbs and pudding until glasses are filled. Top glasses with a dollop of whipped topping and additional cookie crumbs.